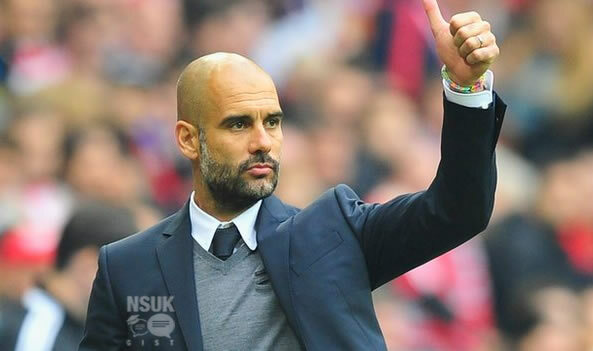 Nsuk Gist: Pep Guardiola To Leave Bayern Munich At The End Of The Season. Pep Guardiola To Leave Bayern Munich At The End Of The Season. The battle for the services of Pep Guardiola can officially begin after Bayern Munich confirmed that he would be leaving them this summer. Guardiola is expected to come to the Premier League - but with which club remains to be seen - with Manchester City, Manchester United and Chelsea all linked with the 44-year-old former Barcelona coach. "We're grateful to Guardiola for everything he has given to our club since 2013," Bayern's chairman Karl-Heinz Rummenigge said in a statement published on the Bundesliga club's website. "I am convinced that Pep and our team are now going to work even more intensively on realising our sporting ambitions, particularly now that it has been confirmed that Pep will be leaving Bayern. "Carlo Ancelotti has had success as a coach everywhere and he has won the Champions League three times. "Carlo is a calm, level-headed expert who knows how to work with stars and plays a brand of football rich in variety. "That is what we were looking for, and that is what we have found. We are looking forward to working with him." Guardiola, has made no secret of his desire to work in the Premier League at some stage of his career and City are currently strong favourites to land him. City director of football Txiki Begiristain and chief executive Ferran Soriano both have a long-standing friendship with Guardiola from their time together at Barcelona and the pair have convinced City’s Abu Dhabi hierarchy that they can lure the Bayern coach to the Etihad. And although Manuel Pellegrini was given a one-year contract extension in August, securing him to the club until June 2017, the Chilean would make way for Guardiola next summer should City persuade him to make the move. Manchester United have publicly said they are happy with current manager Louis van Gaal, however the situation at Old Trafford is becoming increasingly fluid following the club's elimination from the Champions League and concerning results in the Premier League, most recently the 2-1 home defeat to Norwich.